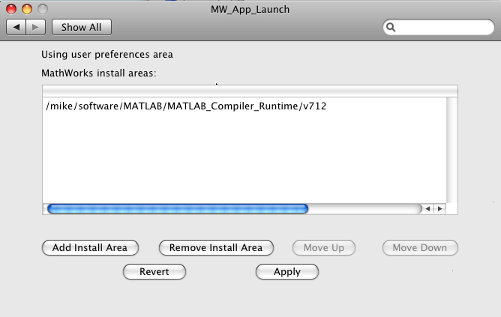 Mac graphical applications, opened through the Mac OS X finder utility, require additional configuration if MATLAB® software or the MATLAB Runtime are not installed in default locations. Install the Mac Application Launcher preference pane, which gives you the ability to specify your installation area. In the Mac OS X Finder, navigate to install_area/toolbox/compiler/maci64. The Mac Application Launcher manages only user preference settings. If you copy the preferences defined in the launcher to the Mac System Preferences area, the preferences are still manipulated in the User Preferences area. After you install the preference pane, you configure the installation area. Open the preference pane by clicking the apple logo in the upper left corner of the desktop. Click System Preferences. The MW_App_Launch preference pane appears in the Other area. Define an installation area on your system by clicking Add Install Area. Define the default installation path by browsing to it. Occasionally, you remove an installation area, define additional areas, or change the order of installation area precedence. Add Install Area — Define the path on your system where your applications install by default. Remove Install Area — Remove a previously defined installation area. Move Up — After selecting an installation area, click to move the defined path up the list. Binaries defined in installation areas at the top of the list have precedence over all succeeding entries. Move Down — After selecting an installation area, click to move the defined path down the list. Binaries defined in installation areas at the top of the list have precedence over all succeeding entries. 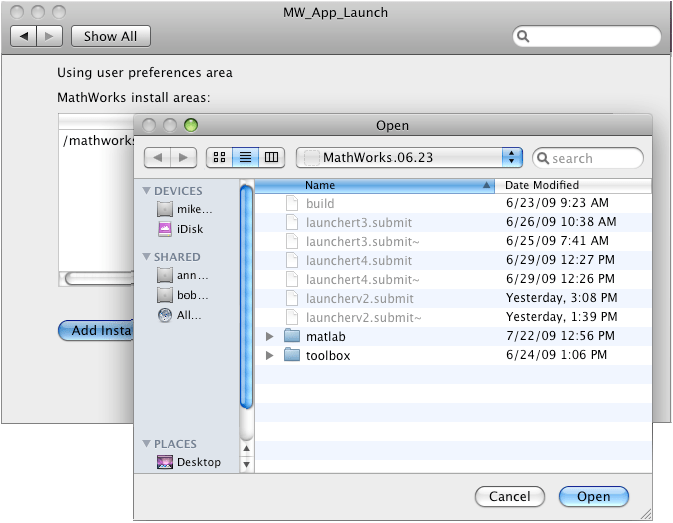 Apply — Save changes and exit MathWorks Application Launcher. Revert — Exit MathWorks Application Launcher without saving any changes. When you create a Mac application, a Mac bundle is created. If the application does not require standard input and output, open the application by clicking the bundle in the Mac OS X Finder utility. If you use applicationCompiler, the application bundle is placed in the for_redistribution folder of the packaged application. If you use mcc, the application bundle is placed in the current working folder or in the output folder, as specified by the mcc -d switch.